Ralph, part of our Kerith community, spent time working with Tearfund in Iraq last year. He has written three reflections on life there, written as though the crisis was happening here in Bracknell. Here is the first of them. Last summer the terrorist group ISIS captured much of Northern Iraq. Millions fled for their lives. Tearfund supporters – many in Kerith – prayed and gave generously to help those who fled, losing homes, jobs, schools, possessions. As security is difficult Tearfund has given few identifiable facts about their work. So, when asked to join their relief setup, flying the day a British hostage was beheaded, my twelve prayer partners were asked not to say where I was. What was life in this crisis like? Imagine what it would be like if you had fled your home, with just the clothes you were wearing, maybe by car or on foot, 50 or 100 miles to safety. Six months on and you’re living in a tent, a makeshift mud house, or a building with no walls, doors, windows, with thousands of other families. Any savings you had, or valuables, have long since been spent. Imagine, you have no toilet or shower. You collect wood to burn to keep warm and to cook. Dry food is given out but fresh food is a luxury – as is warmth, there’s a blizzard outside. You have no regular work, there’s no school, the emergency clinic has few drugs. The terrorists ten miles away keep trying to take Bracknell. Your family, neighbours and friends, who you would normally rely on for support, are scattered. You cannot emigrate, no country wants you. Imagine. What is going to happen next, to you and to everything you hold dear? What can you hope for? And then, a dozen people come around, asking questions in your language. Where are you from? How many people are there in your family? Can we look at where you sleep? Do you have any ID? What work do you have? What do you need to spend money on, right now? You answer: fresh food, blankets, rugs, kerosene heaters, cooking pots, hygiene items, medicine, clothes that fit. They smile reassuringly, write down your mobile number, and leave. You wonder who they were. Days later, after several more phone calls, and meetings with the community leader, you get a text telling you to go immediately to a local empty building. You grab your ID, cadge a lift, and join a well-managed queue. Before you know it, you’re back out on the street, dazed, holding some crisp $100 notes in your hand. You stand there, staring at the cash. Now you have a different problem – but one you CAN do something about. What do you get first? Which shop gives the best deal? What was it that your wife said the family needed most? Tearfund’s field assessors are trained to seek out the most vulnerable. 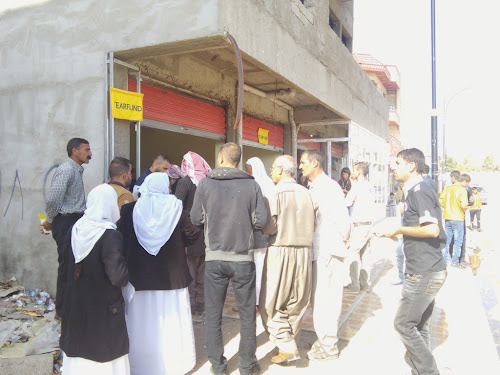 Cash is the most efficient way to provide support in Iraq as there are affordable goods in the shops. Families gain dignity by being able to spend money on what they most need.